Anchor of the number one news show on cable, The Kelly File, Fox News Channel's Megyn Kelly writes her much anticipated book, a revealing and surprising memoir detailing her rise as one of the most respected journalists working today. From the values and lessons that have shaped her career, to her time at the center of the chaotic 2016 Republican presidential primary, this book offers an inside look at an uncompromising woman's journey to the top of the news business. With the same bold and brave voice that has won her fans across the political divide, she opens up about the controversy that made her a household name, telling her side of Donald Trump's feud with her, while sharing never-before-heard details about the infamous first Republican debate, its challenging aftermath, and how she persevered through it all, winning widespread admiration while maintaining her professionalism. 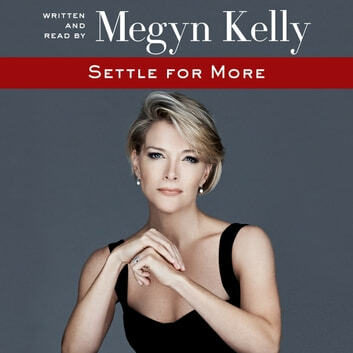 Speaking candidly about the career-changing decision that led her to "settle for more"
Throughout her meteoric career, Megyn Kelly has been a source of fascination and speculation. Men and women, Republicans and Democrats, viewers of Fox News and the network's most diehard detractors have all sought to understand what she stands for and what matters to her. With this deeply personal account of her life, she answers critics and fans alike. At once humorous, uplifting, and revealing, Settle for More offers unparalleled insight into one of the most charismatic and intriguing television personalities in a generation, and will be one of the most talked about books from an influential voice unlike any other.